Banknifty F&O margins going up by 30%? This doesn’t seem to be ending, margins continuously going up. Please vote a better government next time ! How much would the margin become after the 22nd? Around 12k to 14k higher than current requirement. hmm… what has govt got to do with this? Govt actually makes more money as STT if more trading happens on the exchange. More trades will happen if margins are lesser. This is SEBI being cautious and reducing leverage in the system. I am guessing this is only good in the long run. But yeah near term pain until we get used to the new margin requirement. Btw, it is not 30%, closer to 19%. Here is the calculation. Its not just about MARGINS ! SEBI has operated TUGLAQ style in the past few years. Rules are being made in a haphazard manner. And then taken back after sometime or amended. Unscientific methods are being followed !!! Some good things have happened no doubt but overall its like we are in a banana republic. No stability ! Ajay Tyagi is a electrical engineer(UG), Computer science(PG) and Masters in Public Administration ! Do we in India have a dearth of good economics graduates ? Why not pick somebody from IRS ? He is also making rules without enough consultation with all participants. Authoritative style ! Also a history graduate has been appointed to RBI. All this points to mismanagement in Ministry of finance ! I will not talk anything more on this since it is not related to stock markets. as per my knowledge STT was introduce as the long term capital gain was zero but hence the long term capital gain tax is introduced government/sebi must remove STT. You should take up intiative to free the traders/investors from double taxations of STT and Long Term Capital Gain Tax. Your inputs on this is highly appreciated. hmm… the only way to reduce leverage is by increasing margins. I am guessing you are referring to reducing the lot size. SEBI doesn’t want everyone to trade derivatives, so lot size also won’t really come down. I am part of multiple committee’s, bodies etc. This STT should go is something that is pushed every year, I doubt with the current fiscal deficit, Govt is going to go let go of any income, especially something which is as easy as STT to collect. I understand its very difficult for anyone to let go of any income but its like government is robbing its own citizens just because they are not opposing the double taxation of STT and LTCG. so someone should speak up and i think it is you who can raise this issue at higher level. 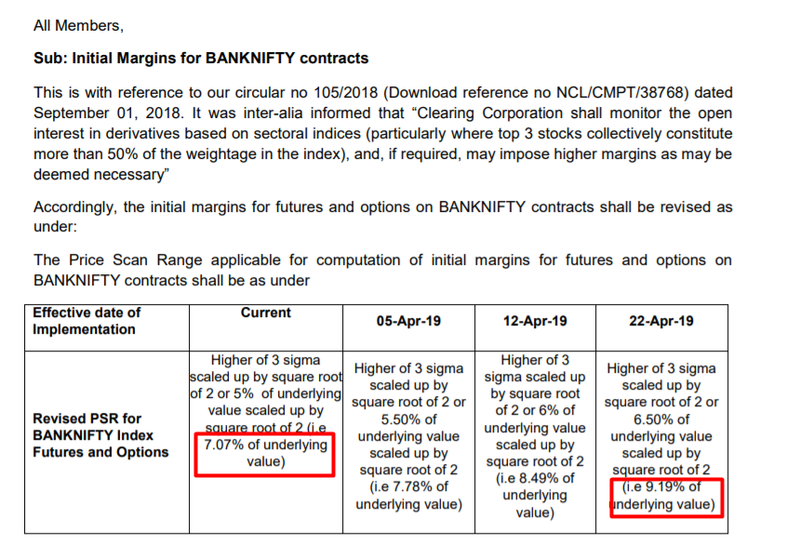 The NSE increased margins on weekly options of Nifty Bank starting the first week of April. I am assuming the minimum charge on options remains at 5% ? They will charge higher of two, so margins will increase. so if margin increase premium will also increase ??? Margins and premiums are different, premium is required to buy first, margin to sell first (writing options).